Welcome to the Gladwyne Fire Company Guestbook. Your feedback is important to us. Feel free to leave your comments. remembrances of the fire company members. My husband would have been very appreciative of everything as he loved the Gladwyne Fire company Dearly! Thanks again for every thoughtful effort to make the wreath ceremony memorable!! That was a beautifiul write up on my husband. He will be sorely missed!!! Guest Name: Robert E. Lee Jr. This is why I am so proud to say that I was involved in such a great origination,You are Heroes,and It is nice to see that your firefighters are always on duty and run towards the danger and not away from it. Years before I joined Buhl, they had bought a truck from your department. I have seen a couple of hoses and nozzles with the name Gladwyne from that truck and was curious about your department. Great website. Rest in Peace Lucky,you were a good Boy! Rest in peace Lucky Dog. I always enjoyed watching you walk through the cemetery early in the morning with your buddy Jack. Enjoy your journey on the rainbow bridge. All dogs go to heaven especially Lucky... Anytime our company would stop by or just make a random visit he knew who his fellow community Firefighters were and would always meet you in the engine room or on the apron with tongue out and tail wagging like crazy ready to greet you!!! R.I.P. Lucky.... You were one of a kind!!! I am a volunteer for Willing Hearts Dalmatian Rescue. Fantastic website. Beautifully done. I lived on Conshohocken State Road many years ago and remember the Fire Chief at that time drove a Mercedes with a red light on the front of it. The best to all my Gladwyne brothers. Stay safe out there. Pet Lucky Dog for me. 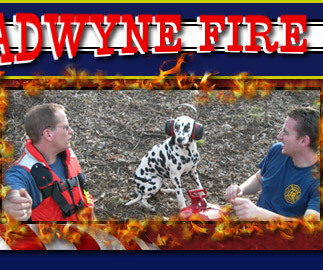 I have looked at a ton of web pages for fire departments. This is one of if not the best I have visited. We thank Fire Fighter Szallasi and company for the awesome tour of the firehouse on Saturday. We learned so much about how you serve our community! Tom Hayden ,I have known For most of my life ,I grew up across the street from him. I will tell you this Tom you are a true Hero and that's a fact,this is not the first nor do i imagine the last time that you have saved a life in our township . I commend you respect you and wish you a very fast recovery . and by the way your your too dam fat for this type of thing. 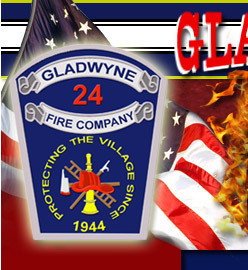 I grew up in the area and moved down south, but wanted to say thanks to you all for your service and dedication to protecting Gladwyne! Trees must be in ,Good luck with tree sales this year. 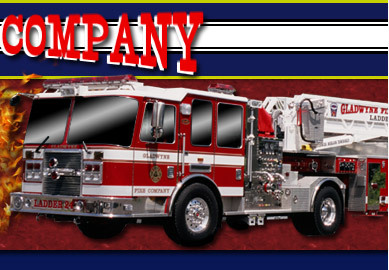 I have a lot of family history with the Gladwyne Fire Company. The actual firehouse is located next door to where my grandparents lived on State Road. My cousin Jack Anderson is a houseman currently serving the Gladwyne community. My grandfather John E. Baltz Sr. was an active member for many, many years. We used to sit in my grandparents living room window and watch the firemen sell Christmas trees during the season.It was always great joy on Christmas Eve to stand out front of my grandparents house waiting for Santa to drive by on the firetruck and get my orange or apple. Such wonderful memories of this great organization. As we pause to remember today, Thank You to each GFC member for your vigilance, dedication, service and contributions to our community. I saw Air 24 in the Baltimore Firehouse Expo. Congratulations on a great looking new piece! Nice truck (Air 24) hope it serves you well !! just wanted to stop and say you guys be safe. loving the snorkel thanks for that deal.